This is the second installment in our blog series looking at all the great news and events 2016 brought for Philly's water community. Part I started with the appointment of Debra McCarty as Commissioner and explored highlights like our new water stations, the amazing work of volunteers, the Green City, Clean Waters Year 5 celebrations, our collaboration with Saint Benjamin Brewing Co. and more. Check it out! In 2016, Philly residents got to meet their watershed spirit animal as we rolled out new storm drain markers featuring a special aquatic critter for each of the city’s seven watersheds. Volunteers have played an important role by signing up for our free marking kits and taking the time to install the new watershed markers at inlets all over the city. Starting with a look at the incredible growth of the Green City, Clean Waters program over the last five years and finishing with a Q&A that explores a storm flood relief project blending green and traditional infrastructure investments, we had an exciting (and busy) Infrastructure Week here at Philadelphia Water. One of the core goals of Infrastructure Week is to start a conversation that gets people thinking about the ways in which things like water mains, highways, bridges and more don’t just “matter” in our everyday lives—they make our everyday lives possible. We looked at the busy crews who clean close to 300 storm drains each day, working double shifts to make sure we’re getting the best drainage possible at our inlets every time it rains. When people hear the word “infrastructure,” they think about roads, bridges and (if we’re lucky!) pipes. Today, we’re looking at a brand-new kind of infrastructure that rethinks an old standard—the water fountain. 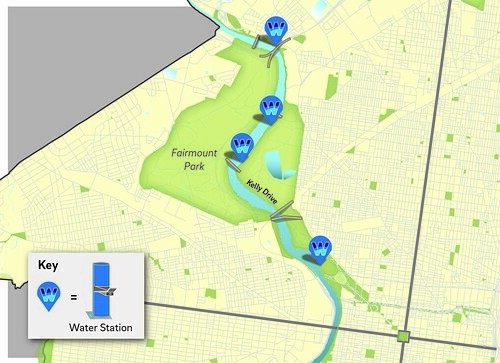 As Philadelphia celebrates the 90th Stotesbury Cup Regatta, the world's largest high school regatta, Philadelphia Water will unveil a new network of four eye-catching public water stations located along Kelly Drive.